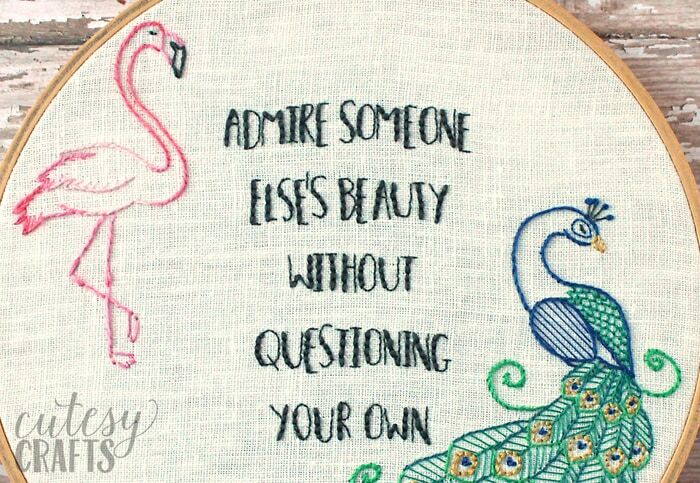 I was browsing around social media when I came across a graphic with a flamingo and a peacock that said, “Admire someone else’s beauty without questioning your own.” It really inspired me. No one doubts that a flamingo and peacock are beautiful, but they are beautiful in completely different ways. You can be happy for someone else’s beauty, creativity, parenting skills… whatever it is, without questioning your own. It’s a great reminder to try and be genuinely happy for other people. Unfortunately, I don’t know where the quote originated, and the graphic has been redone many times, otherwise I’d love to give someone credit. 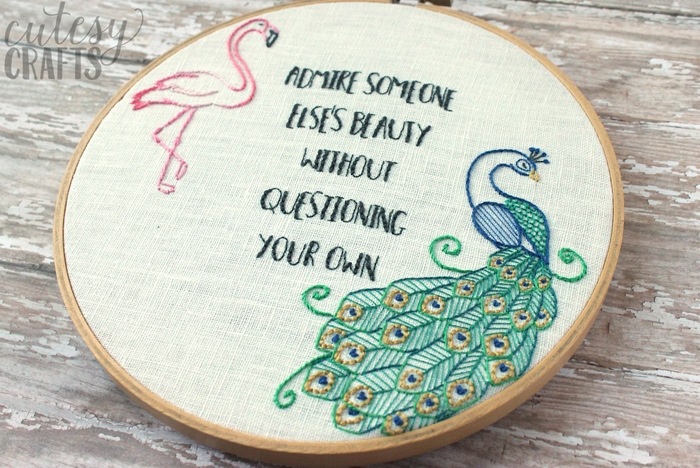 I’m sharing my version of it with you in this flamingo and peacock embroidery hoop. 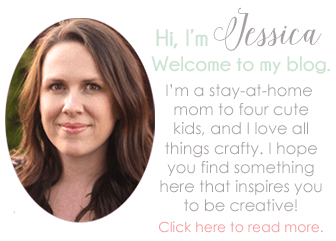 I love how it turned out, and I’m excited to give you the free pattern today! 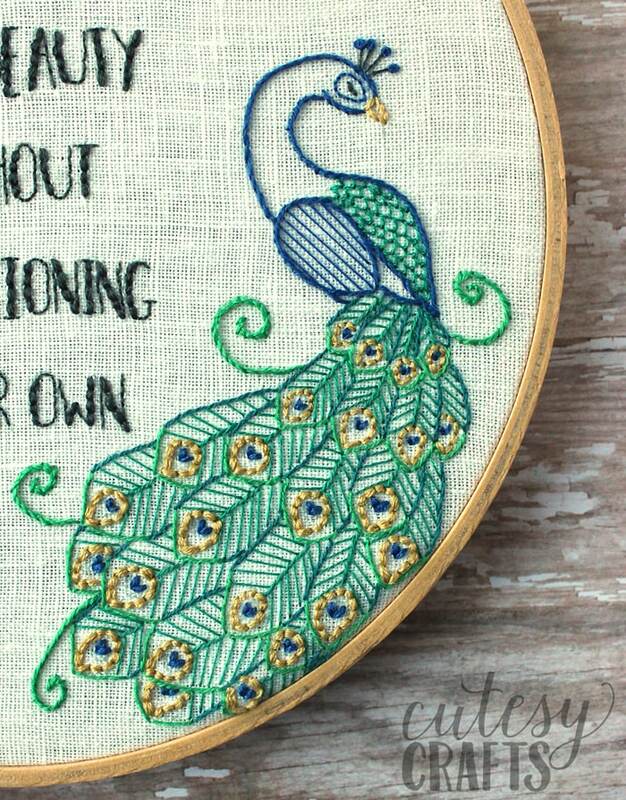 This one has some more advanced stitches in it (on the Peacock), but you can leave out some of the detail to make it simpler. 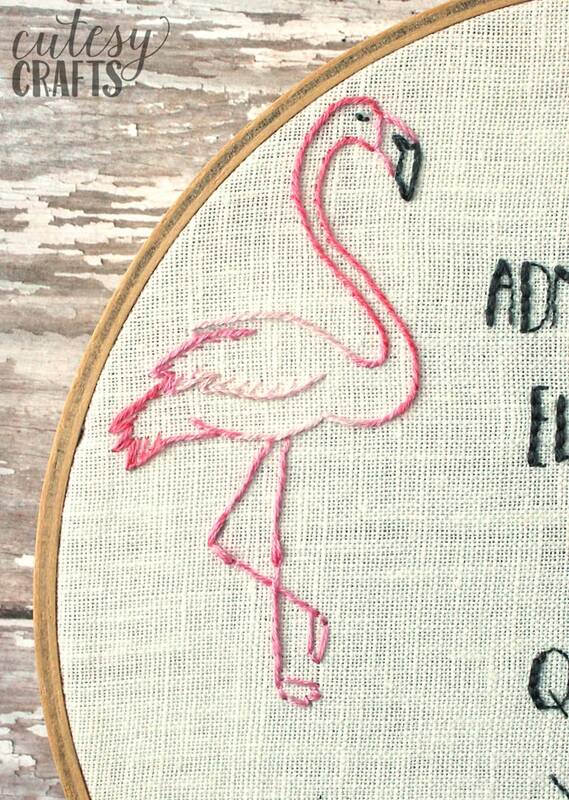 The flamingo is the easiest part of the hoop. The body is just a stem stitch, and I changed thread colors at different parts using dark, medium, and light-colored pink floss. I noted on the pattern where to make the color changes. That can get a little tricky. Just remember that the dark and light pinks always have a medium pink in between them. The peacock was a little more difficult, but you can add as much or as little of the details as you want. I used a lot of single strands of floss, which made it hard to tie knots in the end. You could try out some knot-free methods for securing the thread, and that would probably help. I think I might have broken some kind of embroidery “rule” using one strand of floss, but I really wanted the feathers and other parts to be more delicate. It was all worth it because I love how he turned out. Here’s a nice close-up of the feathers for you. 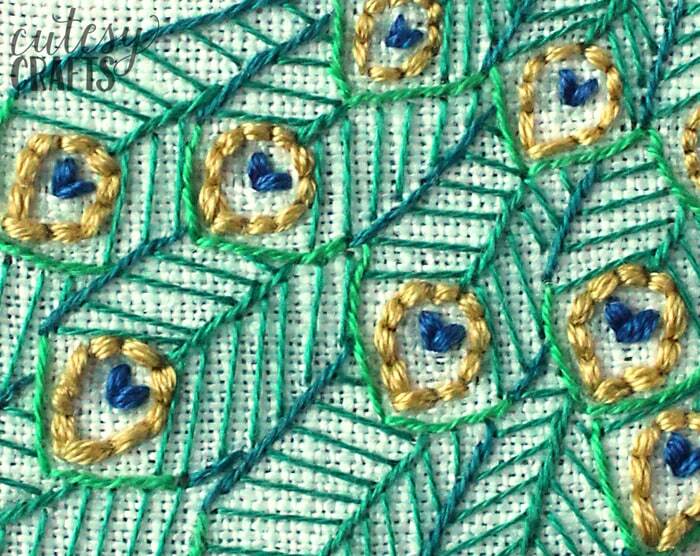 I used three different colors of green on the feathers, which I have noted on the pattern. I didn’t know what stitch to say the dark blue center was, so I just called it a “straight stitch.” You are basically just making a “V” with the thread. I didn’t include the lines for the feathers on the pattern because that made it difficult to trace. 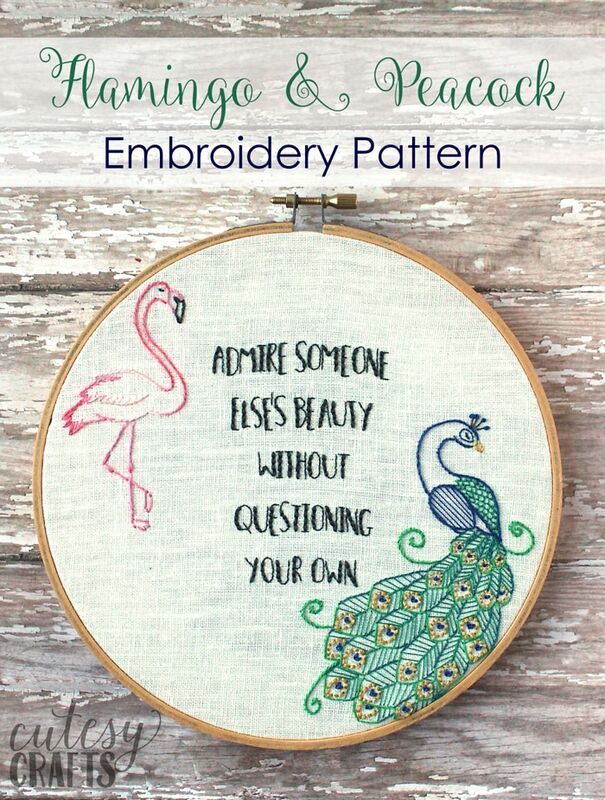 Just fill in the feathers on both sides with evenly-spaced straight stitches. 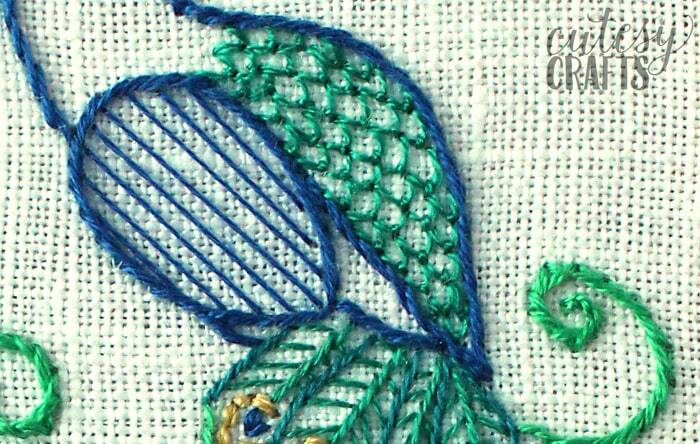 The back of the peacock has a loose fly stitch, with no tail, to make little scallops. If you are a beginner, this is something you could easily leave out. The letters were done using a full strand of floss for the thick parts and a single strand for the thin parts. You could also use two strands for the thin parts, but I really liked the contrast using the single strand. I included two images of the pattern, since there is a lot going on in the instructions. I figured it would be easier to trace the one without all the words and arrows. We are all beautiful in our own way! Hope you love this pretty reminder as much as I do. 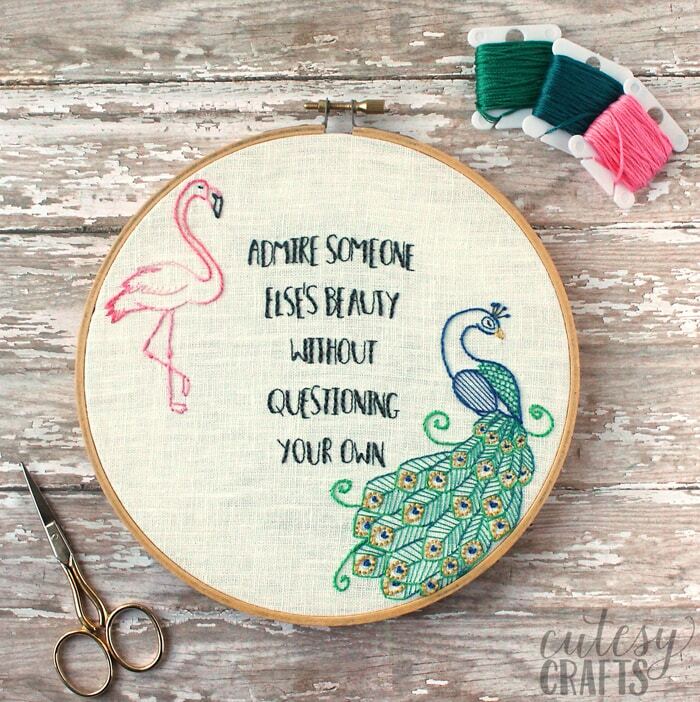 Be sure to check out all of my hand embroidery designs and check out my stitch guide sampler to learn most of the embroidery stitches you will need. This is really beautiful. I’ve just subscribed to your Newsletter and was delighted to find this lovely piece of work, so minutes described. Thank you. So glad you like it! It’s such a great message.